At Duncanville High School, coaches are yelling, stop watches beeping, whistles blowing, and athletes gasping for breathe. That's what you expect to hear and see at track practice when there is just under two weeks before the start of the new season. It's all a part of conditioning. Athletes are separated according to their events as they hesitantly approach the starting line for the start of their next interval. "Next group"....."On the line," they're the typical phrases athletes get used to hearing year after year. In that group of athletes is Marquez Beason. Like the other Duncanville track team members, he too is getting the interval work to raise his fitness level for the start of the 2019 track and field season. However, this isn't typical, and it's not part of the norm for Beason. 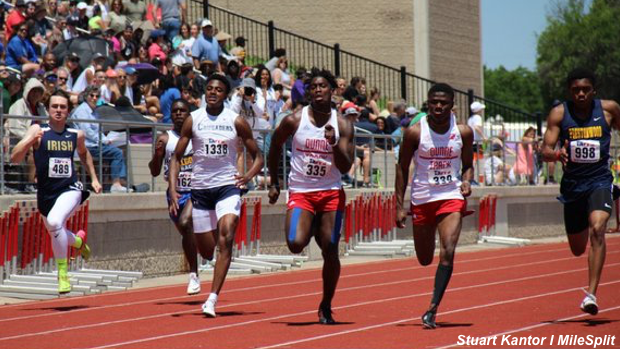 This is the first time around for the senior sprinter at Duncanville. Although he has done this three other times, it was at a different school. Beason started his high school career at Dallas Bishop Dunne where he starred in both football and track and field. After three seasons, he was no doubt used to the process at Bishop Dunne. Now, he listens to the whistles and directives from Duncanville leader, coach Paul. That isn't the only atypical aspect of life for Beason as his life has been anything but similar to that of most youth. The majority of track and field athletes get to go home to mom and dad after school or after practice. Beason will go home as well, but neither mom nor dad will be there waiting on him. His parents haven't been in his life for years. His father has been in prison serving a life sentence without parole ever since Beason was nine years old. His mother has had a breakdown with drugs and has been battling addiction for years. When he turned 16, Beason made a trip to see his father in prison and it's been a little over a year since the last time he saw his mother. "At Dunne, the coaches and everyone always told me to not look backwards, but to stay focused on my goal. Every time I would get down or feel sad about my situation, they would encourage me and keep me moving forward. They would remind me that God has blessed me with talent to make a new future"
When Beason does go home, it is to the loving and supporting atmosphere his aunt Ketra Beason and uncle Archie Beason have facilitated. Ketra and Archie officially adopted their nephew back in 2011. Marquez had previously stayed with his aunt and uncle off and on for stints in the past, while at the same time staying with his mother at times and with others around the city as well. After Child Protective Services (CPS) proceedings that took almost two years, the adoption was made official and they were granted authority to be legal guardians. With his parents absent and the rare occasion that he sees his older brothers, Marquez settled into his current home and family as he fell right into place between his two cousins. Older cousin Rayshauna is a year older than Marquez and is now a freshman at Tarleton State University and younger cousin by a year, Zeriah has been putting it down on the football field with next to Marquez for years. Zeriah just finished up his junior football season and is currently a heavily recruited 4 star wide receiver. Over the last seven to eight years, Ketra and Archie have been more than just an aunt and uncle to Marquez, "They're like a mother and father. They have played a huge role by staying on me, keeping me focused and providing guidance. They showed me what living a good life looks like, that's what I want to do, I don't want to live negatively or live life paycheck to paycheck." Archie, is the brother of Marquez' incarcerated father and coincidentally, he is a police officer. Ketra works at a school and combined, they have provided emphasis on conduct, goals, and education to the entire house hold. That's why Marquez and Zeriah landed at Bishop Dunne. "My uncle Archie has a great relationship with the coaches and the Dean. We knew they had great academics and athletics and it was good for me and my cousin." Beason was able to find the level of academics and athletics he was looking for at Bishop Dunne and he worked his way to being an A/B student. He also worked to become a 4 star All-American and a heavily recruited wide receiver, in football. He starred at Bishop Dunne and this past Fall at Duncanville as he helped lead the Panthers to the UIL 6A state championship game for the first time in 20 years. He also signed a National Letter of Intent to the University of Illinois to play football. Illinois is one of the most prestigious public academic institutions in the country and like at Bishop Dunne, Beason will be able to continue to get the values that have been emphasized at home. "They're like a mother and father. They have played a huge role by staying on me, keeping me focused and providing guidance. They showed me what living a good life looks like, that's what I want to do, I don't want to live negatively or live life paycheck to paycheck." Track has also been an area where Beason has shined. He won the TAPPS 6A 100m state championships as a freshman and a sophomore and was second in his junior year and he has a 10.46 PR. He has played a key part in relay teams that have won TAPPS state titles and a USATF Junior Olympic 15-16 age group national title and National Record. Although, he has achieved what he has worked so hard for the last decade in academics and football by already signing to Illinois, Beason is still motivated enough in track to finish out his high school career giving his all on the track. "Speed helps me a lot in football. It's my biggest advantage out there being able to accelerate like I do." 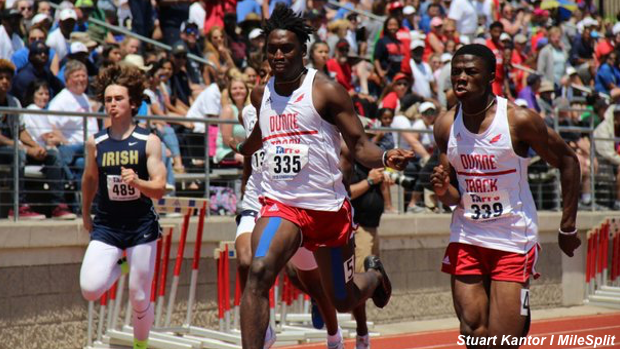 The bonds and friendships he created before moving on from Bishop Dunne are also keeping him invested in this upcoming track season. "My former Dunne teammates keep me motivated. One of them, Jalen Drayden is at DeSoto now and I have to see him and compete against him a couple of times this season. I love to compete, any opportunity I have to compete, I'm going to do just that." His competition level isn't the only thing that will be high come this track season, so are his goals. "You might think I'm crazy, but I want to run 9.9 or 10 flat. I also want to break the state record with my 4x100 relay and win a state title as a team." Over the summer, Marquez and Zeriah transferred from Bishop Dunne to Duncanville, "It was a family decision," Beason said. Duncanville would become an additional extension of family to Beason just as Bishop Dunne was. "At Dunne, the coaches and everyone always told me to not look backwards, but to stay focused on my goal. Every time I would get down or feel sad about my situation, they would encourage me and keep me moving forward. They would remind me that God has blessed me with talent to make a new future," Beason said. Duncanville has been just as supportive, "They tell me not to focus on surroundings, but to focus on goals and the future." The family experiences and situations are the primary things that separate Beason from most teenagers, but family is the feeling he requires and values the most. He chose the Illinois football program for exactly those reasons. "Illinois treated me like family from day one, way back in my sophomore year. They developed a great relationship with my uncle, and they did that before I committed and they have treated me like family ever since." Anyone faced with what Beason faced could have easily taken a different road, but he didn't. He didn't want to and Ketra and Archie wouldn't let him. Of all the things he has seen and been through made drugs, violence, and failure easy options, but guidance facilitated a different path. "My Aunt and Uncle guided me and showed me what a good life is supposed to look like, I don't want anything different." "My family and all of my coaches helped me with how I transitioned from a hard background and kept me positive, they wouldn't let me focus on my situation. That's what I want to get from this and use it to help others. Don't focus on the bad things and situations, but focus on goals. For anybody who is going through similar situations or tough times, just keep God first and talk to people about what is going on and what you're going through. That's going to help a lot!"